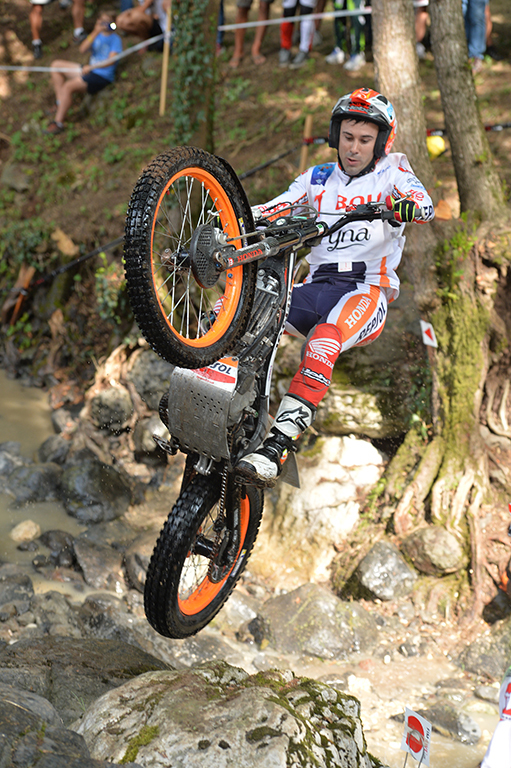 Toni Bou (Montesa) made a resounding return from the back injury that ruled him out of the final couple rounds of the 2018 X-Trial season to rediscover his best form in the FIM Trial World Championship and take an unprecedented twelfth consecutive title in the outdoor discipline, making him a 24-time FIM World Champion. After opening the season with victory on home soil in the foothills of the Pyrenees at the spectacular Camprodon venue, the Catalan rider’s unbroken run of championships was thrown into doubt at a sensational second-round double-header in Japan, where Jeroni Fajardo (Gas Gas) ended a nine-year wait for his second career victory on the first day, as Bou missed out on the podium for the first time since 2012. Bou recovered to take second place on day two but could do nothing to stop Jaime Busto (Gas Gas) from taking a memorable first career win. For Bou the wait for a 100th career victory had to wait for another two rounds, with his 99th in Andorra taking him level on all-time wins with Dougie Lampkin before he finally claimed the outright record in Gouveia, Portugal. Further wins in France and Belgium made it four in a row for Bou and set up a title shot at the penultimate round of the season in front of a huge crowd in the legendary Lampkin’s home town of Silsden, Great Britain, regarded as the spiritual home of Trial. It was another tough trial for Bou on the hills of Addingham Moor, with Spanish compatriot Miquel Gelabert (Sherco) taking a shock early lead, but Bou kept up the pressure on lap two until the youngster cracked, taking a close victory over long-time rival Adam Raga (TRRS) to claim the championship with a round to spare. New rules, a revised format, and a potential season-ending injury were not enough to prevent the unstoppable Toni Bou (Montesa-HRC) from taking the 2018 FIM X-Trial World Championship, his twelfth straight title in the discipline. Bou started the season in typically impressive fashion, taking five straight wins in Vendée, Montpellier, Toulouse, Strasbourg and Barcelona – his twelfth on home soil in a spectacular event that was only decided in the penultimate section. In front a packed crowd of 9,000 fans at Palau Sant Jordi, the Spaniard got the better of long-term and local arch rival Adam Raga (TRS) by a six-mark margin. It would prove to be a decisive result when a fall in a non-championship event in France left Bou with three fractured vertebrae and threw his record run of titles into doubt, with Raga sensing the chance for a fifth crown of his own. Unfortunately for Raga, though, the cancellation of X-Trial Seville reduced the calendar to seven events which, combined with new regulations that discard each rider’s worst result of the season, meant that with just two rounds remaining Bou’s early advantage could not be overhauled. Bou showed incredible heart to compete just a month after his accident and win the opening round of heats in Paris, before withdrawing from the remainder of the event due to his injury. With Bou also missing the final round in Budapest, Raga finished on a high with victory in X-Trial’s first ever visit to Hungary, but once again the season belonged to the impeccable rider from Piera. 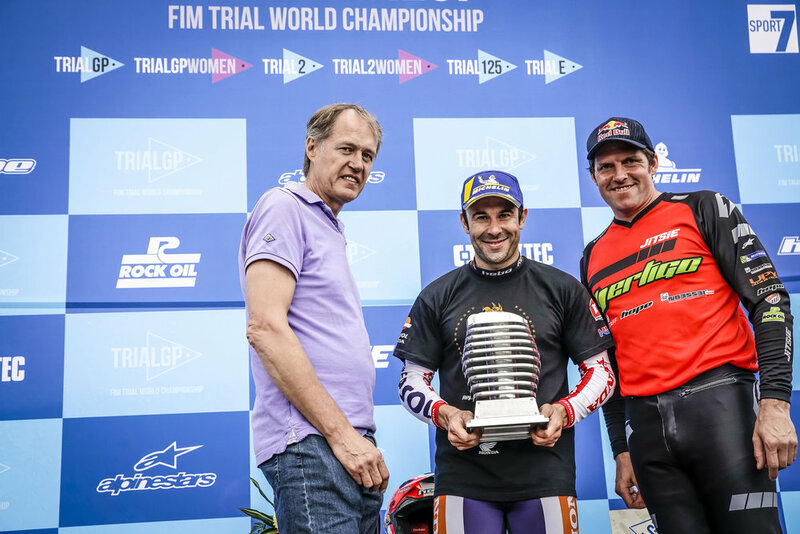 Toni Bou (Montesa-HRC) extended his historic run of FIM Trial World Championship success with his eleventh consecutive title in the discipline to again match his achievement in X-Trial and become a twenty-two-time FIM World Champion. Still just thirty years of age, the most dominant rider in the history of Trial once again rewrote the record books with a round to spare, wrapping up the title in Sokolov, Czech Republic, despite tasting defeat for only the second time this season to his long-time rival and compatriot Adam Raga (TRRS). By that time Bou already had seven victories to his name, including double wins at TrialGP Japan and TrialGP USA, and he signed off from the season on top at TrialGP Italy, the eighth and final round, with another commanding victory over Raga. Jaime Busto (Montesa-HRC) took third in Italy to seal third in the championship and cap off an impressive campaign that saw him get the better of his illustrious team-mate at round three in Andorra, where he finished second to Raga. Worryingly, though, for any pretenders to Bou's crown, the Spaniard celebrated his latest title by announcing a three-year extension to his contract with HRC that will now run until the end of 2021, taking the factory and rider to an incredible fifteen seasons together. It may have only been a four-round season but the 2017 FIM X-Trial World Championship was still long enough for the irrepressible Toni Bou (Montesa-HRC) to hit a number of new milestones in the sport, and although he cruised to his eleventh straight title in the indoor discipline, it wasn't without a fight from his long-term arch-rival Adam Raga (TRRS). Bou kicked off the campaign with his eleventh victory in his home town, capping off the 40th anniversary night of Indoor Trial in Barcelona with a dominant performance at the Palau Sant Jordi, where he picked up just five marks throughout. The Spaniard then headed to the Arena Nova of Wiener Neustadt in Austria and took his 50th career indoor victory in round two before recovering from a shaky start to notch a third win from three on a crucial night in Marseilles, France. Third on the qualifying lap, Bou set a zero on the tricky second obstacle of the final lap, where Raga picked up five points, eventually hanging on to win by just a single point from his fellow Spaniard. Victory for Raga would have set up a winner-takes all final round in Nice but with Bou returning to France with a fifteen-point advantage, he knew he only needed to make the final to secure the title. A fourth win without a single penalty point was a fittingly commanding end to another masterful season from X-Trial's living legend. Toni Bou – Repsol Honda claimed his tenth consecutive title in the FIM Indoor / X-Trial World Championship but he was pushed all the way by his Spanish compatriot Adam Raga - TRS in a series that was reduced to just four rounds. Four-time former champion Raga made the perfect start to the season with a shock win at the opening round in Sheffield, UK, but Bou equalised in the pair's home round in Barcelona, claiming the win as Raga took second. The third round of the season in Wienner Neustadt, Austria, proved crucial as Raga could only manage third behind Albert Cabestany - Sherco, allowing the victorious Bou to open up an eight-point advantage with just one round remaining. An early setback in section two of the qualifying round in Marseille, France, saw him pick up a five-mark penalty but that was the only blot on Bou's copybook on an historic night in the Palais des Sport. The final was a masterly exhibition of Bou's riding prowess as he cruised through all five sections without picking up so much as a single mark. Raga sealed the runner-up spot in the championship with third on the night behind Cabestany, who was again third overall. Bou has now clinched the championship every year since 2007 and has broken just about every possible record in the discipline. 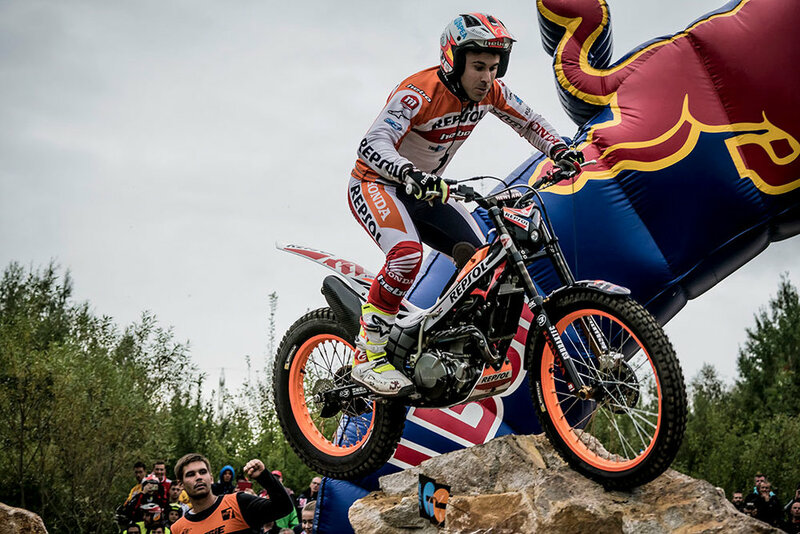 Toni Bou – Repsol Honda made motorsport history in the 2016 FIM Trial World Championship, taking his tenth consecutive title in the discipline to match his achievement in X-Trial and become a twenty-time FIM World Champion. Defending his title with an iron fist from the opening round of the season at Cal Rosal in his native Spain, where he took his 76th career victory, Bou went on to add a further ten wins and three podium positions in the fourteen-counting day championship. Pushed all the way by his great rival Adam Raga - TRS - the last man since Bou to win the FIM Trial World Championship back in 2006 – Bou headed into the final round in Chiampo, Italy, needing only a top-seven finish to secure the title. There was no holding back from Bou, however, as he completed three laps of the twelve-zone course with just 13 points – an incredible 43 less than second-placed Raga – to wrap up the championship in style. Bou put the shine on one of his greatest ever seasons on the second day, taking another win, as his veteran team-mate Takahisa Fujinami – Repsol Honda clinched fifth place to seal a creditable third in the championship after a season plagued by injury.